The kids break up on Friday so the end is in sight. Christmas plays, Christmas concerts, Christmas fairs, Christmas parties, and nativities are all done. Just Christmas jumper day (oh yes! ), Christmas school dinners and one more deadline for me, then we’ve made it. My highlight in all this celebratory bustle was the community nativity in our local park at the weekend. Three of the nearby churches got together to organise it and it was a very special (if rather chilly) experience. Families gathered with torches and lanterns to follow a trail of tealights around the park. We stopped at different stages to hear a section of the Christmas story and sing a carol or two. Lots of people had come in fancy dress so at every stage anyone dressed up as a particular character got to come to the front and act out their bit of the story. There were angels, shepherds and kings of all shapes and sizes, and the littlest donkey I’ve ever seen, who got a resounding “ahhhh” when he stepped forward for the journey to Bethlehem. All the way round we were accompanied by the local Railway Band, which was just brilliant. There is actually nothing in the world like a brass band at Christmas. 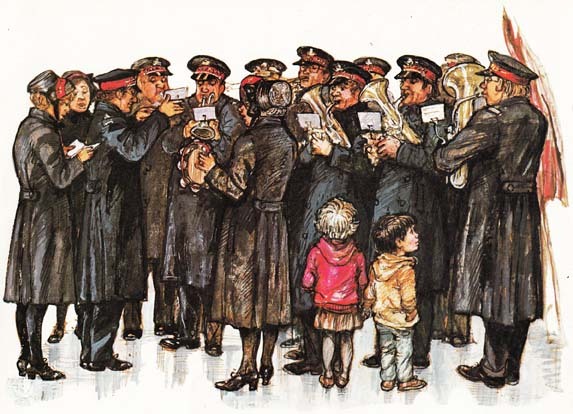 I still well up at the illustration of the Salvation Army Band in Shirley Hughes’ Lucy and Tom’s Christmas, even though I’ve read the book a zillion times at least. I can almost hear them just by looking at it. Finally, as we reached the stable (a cunningly disguised gazebo full of straw bales), the rain started to fall. It could have been very magical if we’d been a bit further north but it is a sad fact about Devon that the only place you get snow is on the moors. So while the rest of the country built snowmen and enjoyed traffic chaos we hurriedly finished off the last carol and then bolted home for tea; all extremely grateful that we wouldn’t be spending Christmas under a gazebo and just a little bit more mindful of those who may be. This entry was posted in Family and friends, Illustration and tagged brass band, christmas, church, Exeter Railway Band, illustration, Lucy and Tom's Christmas, nativity, park, rain, Salvation Army, Shirley Hughes, snow. Bookmark the permalink.